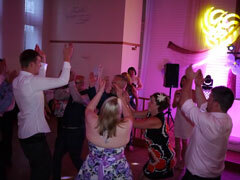 Welcome, and thank you for visiting the Jingles Professional Wedding and Party Disco Website. 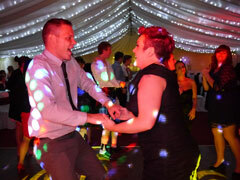 Jingles is the busiest and most sought after wedding disco in Dumfries and Galloway and also South West Scotland. 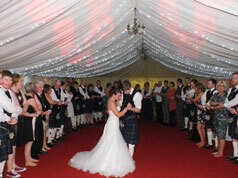 We have been the first choice for hundreds of happy wedding couples over the years. We are privileged to be recommended by and play at many local wedding venues including Easterbrook Hall, Friars Carse, Hetland Hall Hotel, Mabie House Hotel, The Woodland House Hotel, The Crichton Golf Club, Springkell Mansion Locharbriggs Social Club and the Cocoa Bean Company. 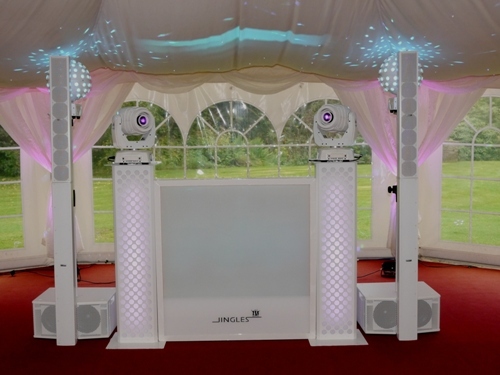 Jingles Wedding Disco does book up very quickly so if you are planning your wedding and looking for a wedding DJ in Dumfries and Galloway, South West Scotland, with an excellent reputation and a disco set up that will wow your guests please get in touch. 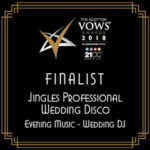 Jingles is delighted to announce that we were finalists at the prestigious VOWS awards in Glasgow last November. It was an absolute honour and we are very proud to have made it to the finals of such an amazing awards ceremony. We are absolutely delighted to announce that we are the first Professional Disco in Dumfries and Galloway to achieve the D&G Council trusted trader award. The scheme is a local business partnership which aims to increase consumer confidence and promote good practice within local businesses. Our business has been vetted by both the council and trading standards to allow us to achieve this award. Put a face to the DJ! 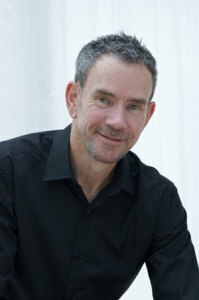 My name is Mike Wells. I started Jingles in 1983 along with my brother. For the past nine years I have been running the disco myself and on a full time basis. Being full time allows me to concentrate on and spend more time on something that is not just a job it is something I love. Although I am more than happy to DJ any type of event, I am passionate about weddings. 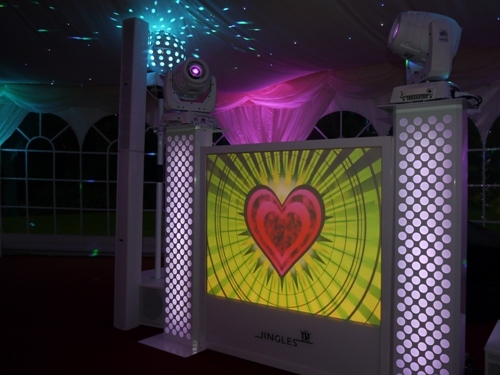 Jingles has built up a name as the wedding disco for Dumfries and Galloway. Did you know we offer a video service? A DJ who is passionate about each and every event. I am not an agency and I only operate one disco unit per event. This allows me to concentrate fully on each function. 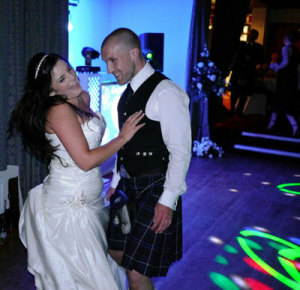 You will have booked a DJ who uses the very best in equipment and is always striving to improve. Expect excellent customer service from your first point of contact until the end of your special night. I am always available to answer any questions you may have leading up to your event. A DJ who wants to make your night a success. You have a say in what I play! I am happy to accept a playlist before your event. This allows me to find out in advance the type of music you require. I also put request cards on the tables to allow your guests to choose some of the music as well. A disco that is fully legal. All of my equipment is electrically tested on a yearly basis so that it is safe to be used in public. I carry full public liability insurance and am a proud member of the National Association of Disc Jockeys. 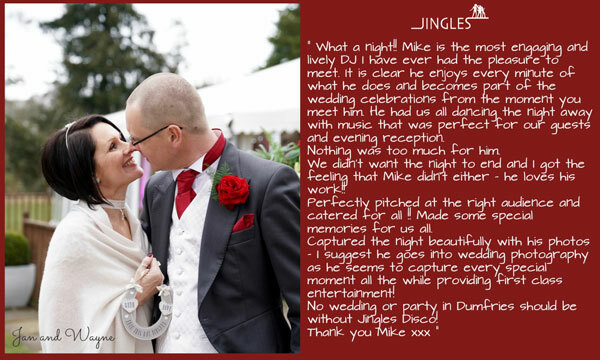 Whether you are looking for a Wedding DJ in Dumfries and Galloway, Gretna or Cumbria or a Party DJ, Jingles is one of the areas longest established mobile discos, and I feel I have the experience and commitment to give you and your guests a night to remember. You will want to look before you book! As you will want to view your wedding or party venue before you book, I believe that you should have the same option with your disco. I am extremely proud of the way my disco looks. It has been designed to look clean and tidy if set up through the day and amazing at night time. It has even been featured in a national DJ magazine! I have recently upgraded to a white sound system to further enhance the appearance. I am more than happy to show photos of my set up. 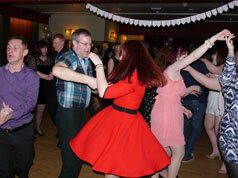 In fact all of the photos you see on my website have been taken at actual Jingles events. Please note: The photos shown above are part of my wedding set up. If you would like this look for any other type of function, please contact me for a price.